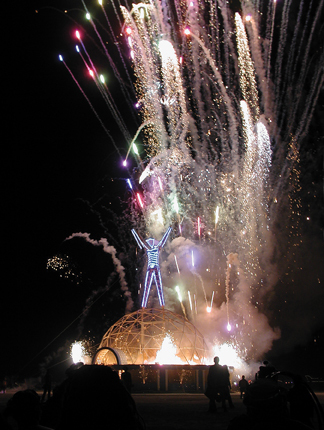 Over ten years ago, I went to an “art happening” called Burning Man. This event takes place once a year, in the middle of a desert, in Nevada, at a place called Black Rock City. I was so unprepared for the all of creativity I saw there,… and the chaos. The artistic expressions and the shock of the things that I had never seen before demanded to be reckoned with. I wanted to remember the wonder and the amazement of it all so I took pictures, hoping, in some small way, to capture the essence that is Burning Man. But the idea of putting these images in a little photo album just didn’t seem right. I was inspired to push myself to make something that would keep these images more present. I just didn’t want to forget how inspiring the event was. I decided that I wanted to present these images in some sort of shrine. At the time, I wasn’t very handy and was certainly pretty scared of power tools. Within a few months of starting the shrine I stopped. Distracted by life, I felt unsure of where I was going with this project but I had already accumulated lots of antique wood, tokens from Black Rock City and a ton of items that I have been collecting over the years. Timidly, I thought that I could make other shrines or objects with these spare parts. In time, these art projects became Foundlings. Like so much in life, what you get form an experience is largely what you bring to the experience. This event is not for everyone but for some, this event can be so transformative. Perhaps I was ready to start expressing myself and just needed a little nudge. In the last month I have finally returned to this shrine and am determined to finish it. I am not sure that it is, strictly speaking, “art” but it will be an important tribute to inspiration. I am so grateful to Burning Man for inspiring me. Have a good burn.